All Posts relevant to the Mega Ride in here please!! Lets all put some pics and your story of the mega ride in this one post. I thought it would be good to get everyones version of their own mega ride. It will make for some interesting reading over the next few weeks, maybe someone could collate it afterwards and put it into a small magazine or book. Ok I'll start with my story of the mega ride. I'll start a bit earlier in the week, I got a call from Gringo on Tuesday, "can you come around give Spokes and I a hand, to put my 750 4 motor in my bike" Gringo asked. I said "sure mate I'll grab Bucket too, but lets keep tooling until your motor is in and started, see you soon mate." 4hrs later the motor was in and bike started, just a few minor things for Gringo to tidy up, but he was now sorted. Thanks Gringo for having us over for bikes, tools, beers and lots of fun, I know we were there to help you but it's always fun to get together, cheers mate. My turn on Thursday night, Bucket and I run some tools over my bike and got all the little things sorted out, new bracket for my cracking number plate, checking oil and any lose bolts and make sure all wiring was conected, just general stuff for a Triumph. 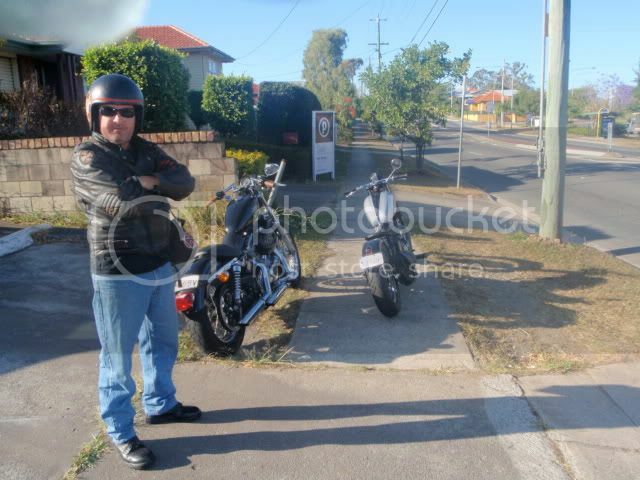 Bucket and I left at 7am 10/10/09, we were both looking forward to this ride even if we were only going as far as Moree. It's always good to ride and catch up with other mates. We stopped just down the road to meet Spokes and Gringo once we saw them we just tagged on, no stopping till Aratula, that's the plan. Plans are good but when you ride a Triumph, it's always good to keep an open mind. Ten minutes into our ride, my bike stopped, DOH, we pulled over and found a loose screw, no it wasn't the rider this time, tightened it up and off we went, easy fix. Break Down Record: Triumph 1, thanks Gringo for keeping score. Onto the Ipswich Hwy and SGT tagged on to us, near the off ramp, that's all of us now so straight to Aratula, to meet the others. 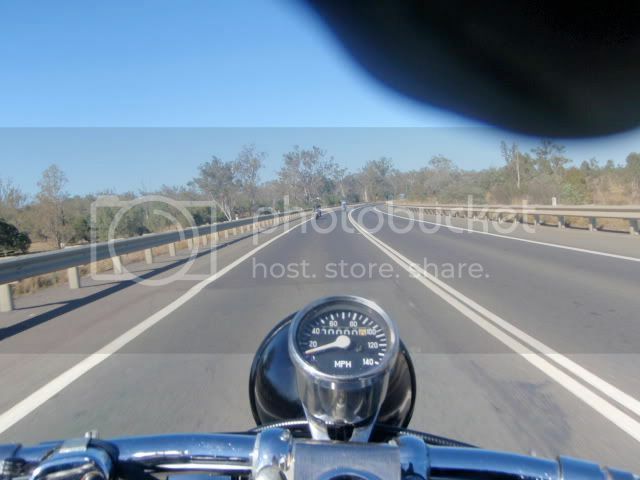 By the way, my speedo does not work, so I was relying on Bucket to keep me on the speed limit, cause the Triumph just goes so fast. 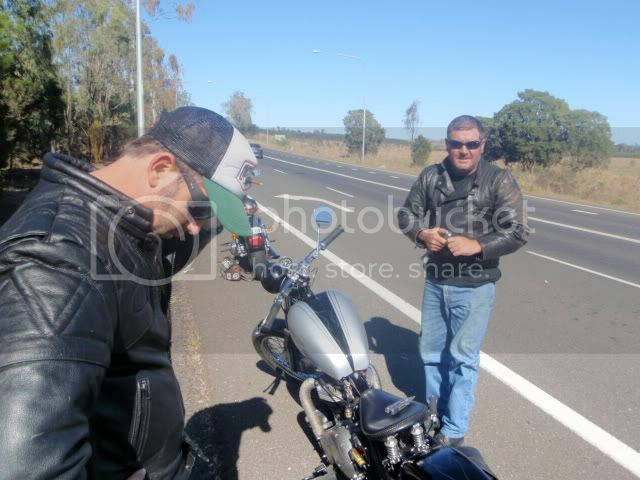 Now cause my bum was already sore from riding a rigid, we thought we would pull over and have a rest before Aratula, no just kidding, it was a forced stop, yes it was my Triumph again. This time a loose wire, no not the rider again, we fixed it and took off again. 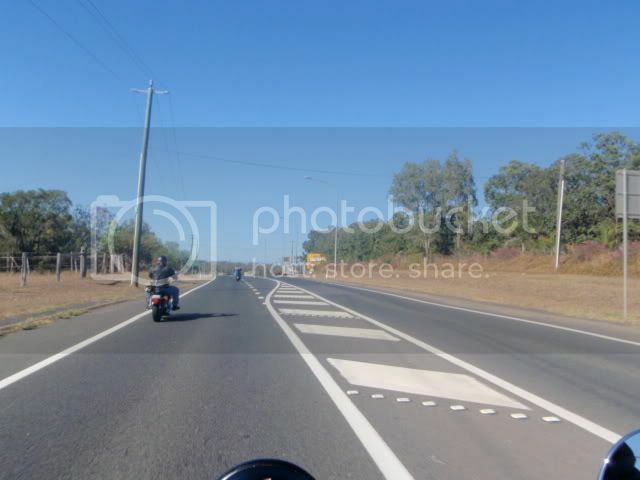 Thanks to mates helping you out on the side of the road and mobile phones to inform the others of whats happening. Break Down Record: Triumph 2. We rolled into Aratula to a patiently waiting mob of friendly faces and some cool bikes. Thanks also to Pullmyfinger and his crew, for meeting us at Aratula, stay cool mate and see you soon for the Xmas do. 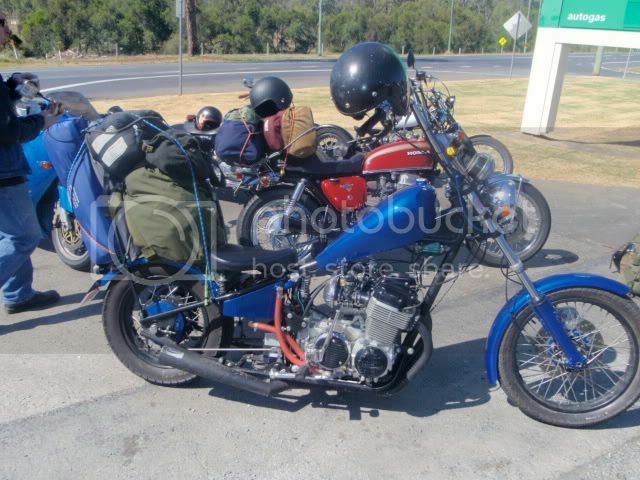 We waited for an extra 40mins as Bobba, JJ and Tex were running late, JJ lost his rear brake and licence plate and Tex had some engine issues, unsure of these details, maybe Tex will fill us in. Bobba and JJ arrived with out Tex and said Tex may catch up with the pack later in the day or the next. Break Down Record: Triumph 2, Harley 2. So we headed off to Warrick for a beer as we were a bit parched. 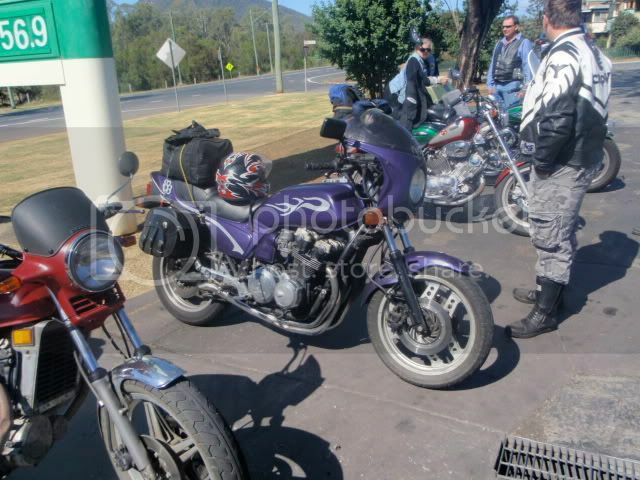 Well my ride was good the motor was going well I was having fun and looking forward to more fun with mates and the road. Then the Triumph made other plans, DOH, the motor stopped again, loose screw again, no not me, different screw, it started and off we went, back on the road. 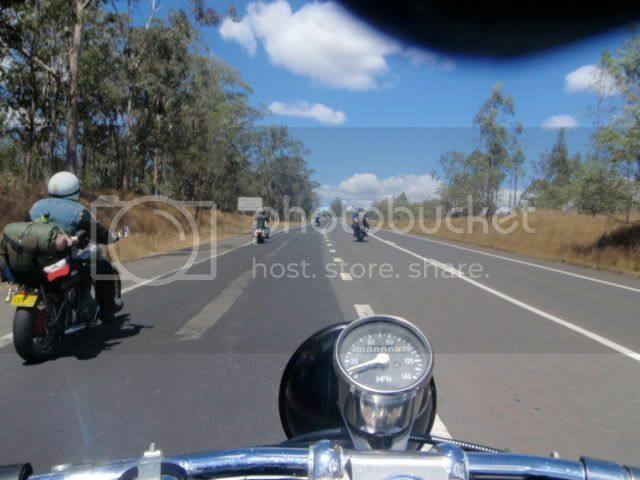 Break Down Record: Triumph 3, Harley 2. I made it another 200m then nothing, we played around with it for about 1/2hr and found that the battery had discharged and was dead. No go for me, end of the road. But JJ and SGT stayed with me until the trailer arrived, luckily two out of three phones had some coverage, 3hrs later we had my bike on the trailer. Thanks JJ and SGT for hanging around and keeping me company. 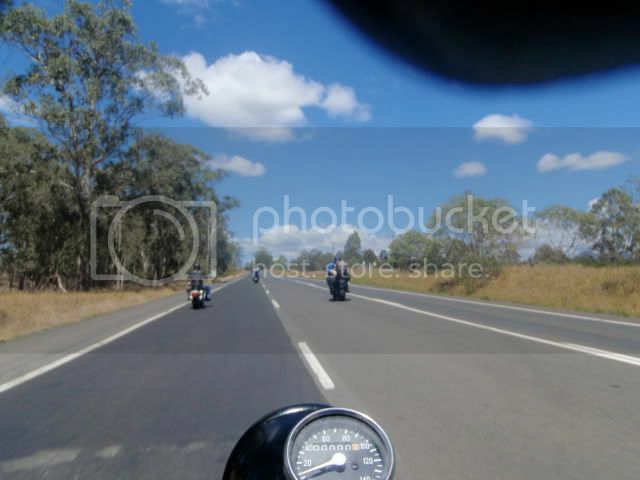 These guys also ended their ride here with me and went home from there as it was about 3pm Queensland time, to late to make it to Moree. 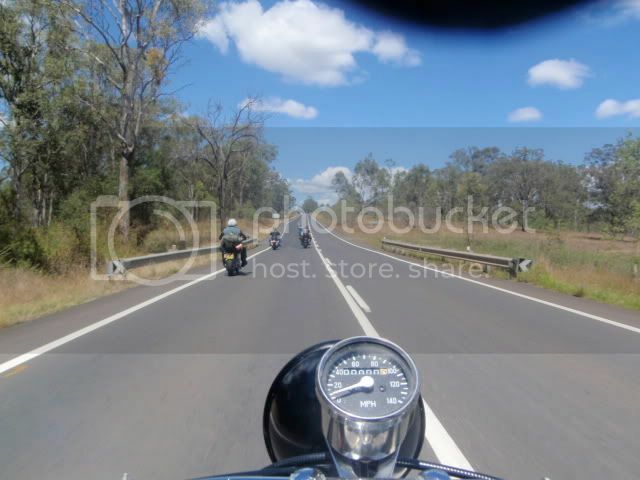 Break Down Record: Triumph 4, Harley 2. 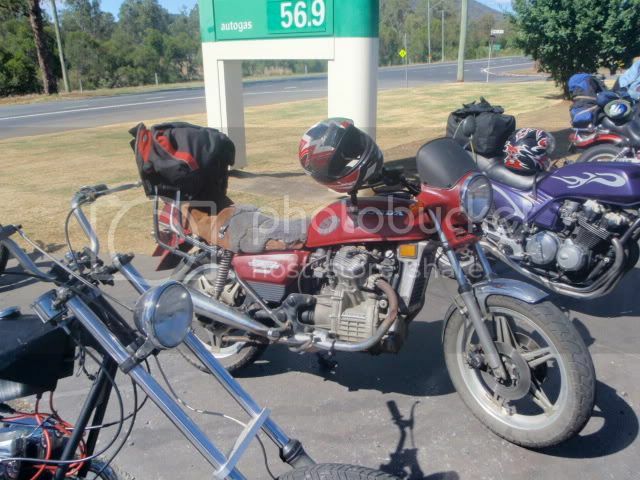 So that's my journey, I didn't make if very far but I still had a great time on my bike, with mates and the road. Good luck to you all, may the god of machines be kind to you all. Looks like some nice bikes there, can't wait to join them. Sorry you had to drop out. Awesome. Another CX500 !! Thanks Ben, Good read. Lucky man, having a Missus like that. I just re-read that, it didn't come out right. Bearcx wrote: Lucky man, having a Missus like that. 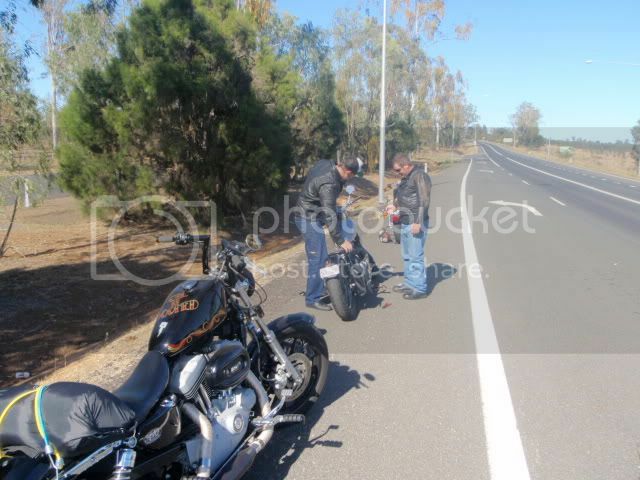 sorry to hear your ride was cut short and thanks for the pic's and report for us who could not make it. Yeah, that was great, great pics as well. Well this place is ready to recieve the whole crew on Tuesday arvo. The fridge is stocked and the BBQ is ready to fire, the grass is mowed and the neighbors are all tuned in. We have enough food to feed a small army, which is handy because a small army is about to decend on us. I'll see the crew in Nagambie, at about 2.00 in the afternoon. Anybody from Melbourne that wants to come with me, I'm leaving at about 11.30 tomorrow morning from Taylors Lakes. 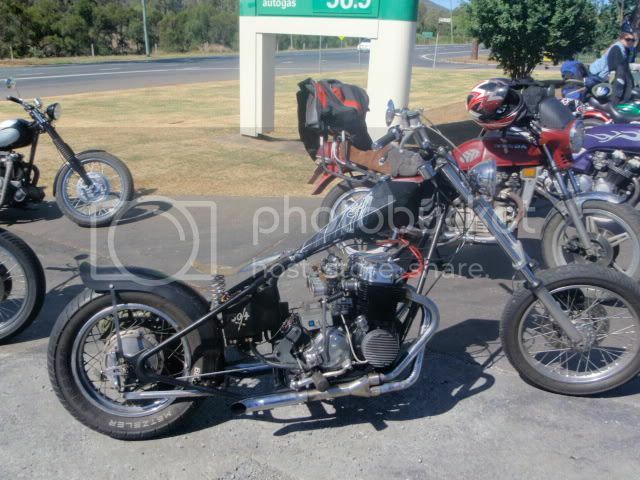 A custom bike or a chopper should be something that has had the original essence of its existence altered to project the skills, objectives and artistic vision of its creator so the viewer or “beholder” and the creator can be positively stimulated by the actual bold or sublime beauty of the bike. Both need to project an essence of suitability, practicality, function and righteousness that has no stand for mediocrity or aesthetic blasphemy. Have a good ride, see ya all Wednesday at Port Campbell when ya get there. There is a servo, food joints & pub there so would be ok for lunch if ya make it by then. That's all we've had all the way so far. All at Ollies most wonderful feast. There are a lot of non forum people around the world watching this, I have been keepin the ones on The Chopper Underground as well as Chopperfix up to date on it, been gettin a fair amount of good feed back on chopperfix including some like the content of our forum! As I am going tomorrow can another member of those forums keep them up to date? We may get a few new international members through this event & hopefully some new local members as we meet people along the way. put your mobile number on a PM for me mate!! See ya all tomorrow, nearly got everything packed ready to leave in the morning. 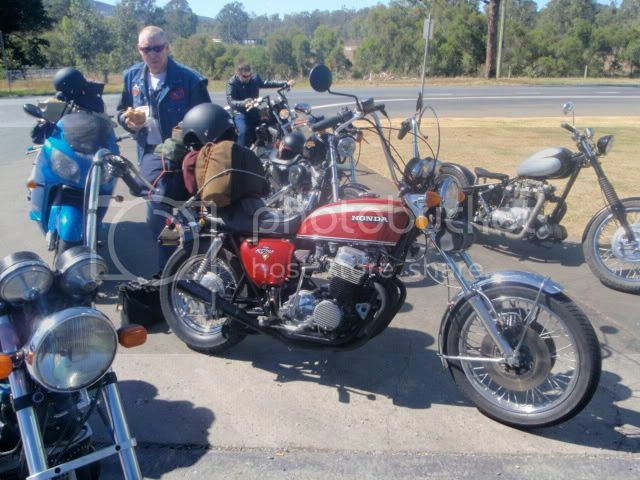 bendnstretch wrote: Break Down Record: Triumph 2, Harley 2. 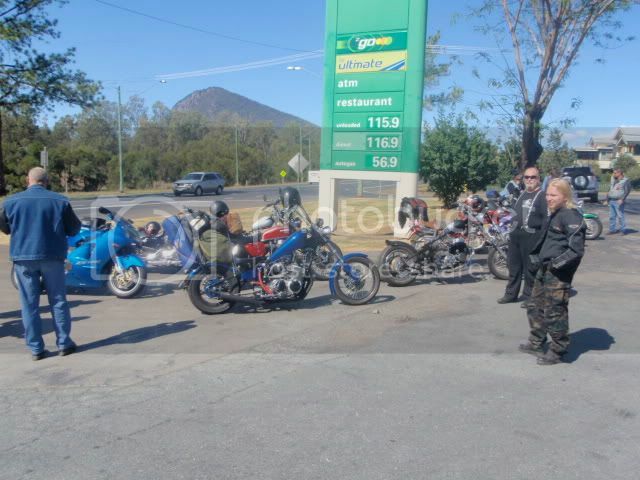 Tex has rejoined the group , rode 8hr's to Narandera NSW , The "Allies" should arrive in Melbourne tommorow 14-10-09 , partied in Moree with Rob and the the rest of the "cotton cruzers" .Partied with 5 other Estonians in Dubbo , but Narandera was the best we've had on the road , the publican was totaly awsome , free rooms and DRINKS and a couple of local lady's . the western plains is awsome riding , but the further south we went the more the weather became more crusty , so far we average 100 k's an hour ,sitting on around 110-140 on a rigid , as Spokes dosen't have a working speedo he just sat with me . Tommorow is servicing and just basicly tinkering for the second leg into S.A at Old Farts workshop . So far it's been an absolute BLAST . Thanks for the update, will you be latter gettin out of Melbourne tomorrow with doing matanence on bikes? Would rather leave later than be waiting for hours at Port Campbell.